It’s true. Girls like jewelry. That said, it’s not like we’re all clamoring for ginormous blood diamonds, but a little bling, regardless of price is just the thing to make a girl (or boy, to be fair) feel special. 1. Pikachu Pendant – At $13, why wouldn’t you choose him? 2. Tiny Bat Signal Earrings – A subtle way to call on the Dark Knight. 3. MST3K Locket – Put any pic you like in it for Joel, Tom et al to heckle. 4. Health and Mana Friendship Necklaces – It takes more than one to finish most boss battles. 5. 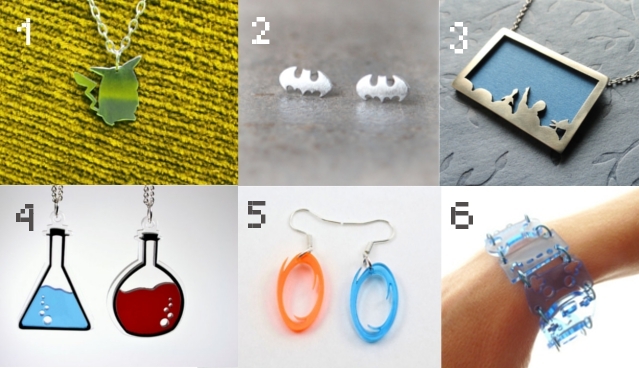 Portal Earrings – You monster. 6. Controller Bracelet – Nine different controllers in your choice of four colours.